Artist's rendering of Eris, announced in July 2005 by Mike Brown of Caltech. It is more massive than Pluto. The sun is in the background. Astronomersrevealed this month that the dwarf planet Eris, near the edge of oursolar system,has a surface similar to Pluto's ? the latest revelation about an icyworldthat, even five years after its discovery, holds a pivotal place in theplanetary debate. Erisis largerthan Pluto and three times farther from the sun. Astronomersdiscovered thesmall world in January 2005 (and later spotted its moon Dysnomia),setting inmotion events that would ultimately lead to the demotion of Pluto fromfull-blown planet and to the rise of the "dwarf planet" category. "Insome ways, what it did was really open up the entire outer solarsystem," Eris'discoverer, astronomer Mike Brown of the California Institute ofTechnology,has told SPACE.com. Erischanged planetary science by creating room for a third category ofplanets,distinct from the four terrestrial planets and the four gas giants.They are calledtrans-Neptunian dwarf planets, or plutoids, and researchers expect tofind manymore of them in coming years. "It'sbecoming common wisdom that dwarfplanets are the most common type in the solar system," saidAlanStern, a planetary scientist at Southwest Research Institute in SanAntonio. Sternrecalls writing a paper in 1991 suggesting hundreds of Pluto-scaleworlds inhabitedthe outerreaches of the solar system. "It's completely panned out, andI'm veryhappy about that," he said. Thecorroborating evidence would take nearly 15 years to obtain, however. Startingin 2000, Brown, working with Chad Trujillo and David Rabinowitz, beganadetailed survey of the northern sky, searching for moving objects thatwouldqualify as new planets. Fiveyears into the search, the researchers had turned up nothing. "Youcondition yourself to knowing what to expect," Brown said. "When itshowed up on my computer screen, it took me about 30 seconds to know itwaslarger than Pluto. I almost fell out of my chair." AfterNASA's official announcement of the discovery of a "10th planet," thename that caught on for it was "Xena." That proved to be aplaceholder until the International Astronomical Union accepted Eris astheofficial name in September of 2006. Inthe five years since the discovery, Brown said, researchers trainednearlyevery terrestrial and orbiting telescope on Eris to flesh out a basicpictureof the dwarf planet. Images from the Keck telescopes in Hawaii revealedit hada moon. 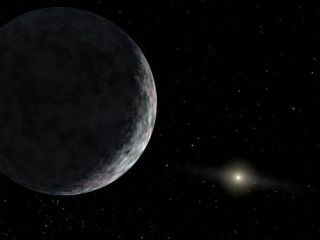 TheHubble Space Telescope pegged the dwarf planet's size at approximately1,500 miles(2,400 kilometers) across, while measurements made at the Gemini NorthTelescope in Hawaii indicated the presence of methane ice on itssurface. Butthe most intense scrutiny may have centered around Eris' effect on theclassification of Pluto. The possibility of discovering an 11th planet? and a 12thand a 13th and so on ? made Pluto's status a pressing matter forastronomers. OnAug. 24, 2006, the IAU resolved the conundrum by designating Eris andPlutodwarf planets, based on the fact they hadn't cleared their orbitalzones ofother rocky objects. The number of full planets in the solar system wasthusreduced to eight. Asan astronomer, Brown agreed with the decision. "It'sthe right thing to have happened," he said. "I'm happy the solarsystem is finally organized correctly." Butalthough the reclassification was faithful to the idea that Eris andPlutorepresented a distinct type of planet, it frustrated researchers whohad dedicatedtheir careers to studying Pluto. TheIAU's decision was "laughable," said Stern, principal investigatorfor the mission of the New Horizons spacecraft to Pluto. "Ithink most people know a planet when they see one, and I guarantee whenpeoplesee the images from the Pluto system, they're going to recognize it asaplanet." Sternand Brown can both agree that New Horizons will add a new level ofunderstanding to the dwarf planets of the Kuiper Belt beyond Neptune.The probe,due to reach Pluto in the summer of 2015, is expected to shed light onPluto'ssurface, interior and atmosphere. Furtherdirect studies of Eris will have to wait until the next generation oftelescopes comes online, Brown said. Betweenthe planned 30-meter telescope, the European Extremely Large Telescopeand theALMA radio telescope in South America, astronomers will be able tobetter mapthe surface of Eris and gauge its temperature, and new infraredtelescopes willallow more-precise measurements of Eris's surface composition. Brownsaid he would love to be able to stick around for 290 more years, forthe timewhen Eris will approach as close to the sun as Pluto is now. "Twohundred ninety years is probably a pretty long time to wait," he said,"but hopefully it'll be a pretty spectacular sight when it comes."